With their yellow/black tiger stripes and long, barn-swallow tails, Tiger Swallowtails are perfectly named. Large and showy, they tend to be noticed by even the most oblivious bystander. Only the Monarch is more firmly embedded in our collective American consciousness. I start watching for newly-emerged Western Tiger Swallowtails (Papilio rutulus), common to the Western states, on sunny May days. During the early weeks of summer, the tiger-tails often glide through my garden without stopping to take nectar from flowers. In midsummer, when they're more abundant, the butterflies frequently linger in the garden. They'll perch on sturdy flowerheads, such as those of purple coneflower (Echinacea purpurea), and sip nectar from the many individual florets. They may flutter their wings while feeding, perhaps as a means of keeping balance. From my lawn chair near the butterfly garden, I watch as the late-afternoon sun illuminates their yellow wings. Because the Western Tiger Swallowtail produces only one brood per year in the Northwest, these few glorious weeks will have to satisfy me until next spring (up to three broods may occur in California and the Southwest). Even more impressive in size (up to six-inch wingspan, compared to four inches for its western counterpart), the Eastern Tiger Swallowtail (P. glaucus) bears similar markings of vertical black stripes on yellow, with black wing edge and two blue spots near each tail. In addition, it has orange markings near the tail and at the hindwing's upper edge. Some female Eastern Tigers adopt a dark form, with mostly-black wings, thus gaining protection from predators by resembling the Pipevine Swallowtail. This distasteful butterfly feeds on pipevine (Aristolochia spp. ), and it is also mimicked by the Black Swallowtail, Spicebush Swallowtail, Red-spotted Purple and female Diana Fritillary. Female offspring of dark-form Eastern Tigers will also be dark in color. Eastern Tiger Swallowtails can be found east of the Rockies, in an almost perfect complement to the Western Tigers' range. They, too, produce one brood in the north. Further south, three or more broods are common. Until recently, a smaller form of Eastern Tiger Swallowtail that is found in Canada and Alaska was considered a subspecies of P. glaucus. It's now referred to as the Canadian Tiger Swallowtail (P. canadensis). Tiger Swallowtails spend much of their lives in the canopy of broadleaf deciduous trees. I've often seen them fluttering high in bigleaf maple trees, where female Western Tigers lay their eggs on the leaves. There, hatching caterpillars have a relatively safe environment in which to feed and grow. They spend daytime hours resting on a silken hammock attached to a leaf, coming out at night to eat foliage. In the eastern half of the country, female Eastern Tigers lay yellow-green eggs singly on leaves of willow (Salix spp. ), birch (Betula spp. ), black cherry (Prunus serotina), ash (Fraxinus spp.) and tulip tree (Liriodendron tulipifera). Western Tiger Swallowtails prefer leaves of willow, bigleaf maple (Acer macrophyllum), aspen and poplar (Populus spp. ), Oregon ash (Fraxinus latifolia) and sycamore (Platanus spp.). Their eggs are shiny and dark green. Early-stage larvae resemble brown-and-white bird droppings. After molting two or three times, the caterpillar turns apple-green with two fake eyespots and a horizontal yellow band over its enlarged, headlike thorax. When threatened, it extends a foul-smelling, fork-shaped appendage on its head called an osmeterium. The effect to an unsuspecting bird is that of a fork-tongued snake! This startling defense mechanism can intimidate other predators like wasps, according to Dr. David McCorkle, Professor Emeritus of Biology at Western Oregon University. While standing next to a quaking aspen tree in his yard, McCorkle witnessed the repulse of an attacking yellow jacket by a Western Tiger Swallowtail caterpillar in the tree. A slight movement by the caterpillar had brought the yellow jacket zooming in from several feet away to grasp its prey. The caterpillar suddenly thrust out its osmeterium, causing the predator to let go and fly off in defeat. A final-instar larva has molted four times; it's fat, smooth and up to two inches in length. When about to pupate, it turns brown and heads off in search of a place to shed its skin for the last time and become a chrysalis. It may travel a very short distance to a craggy spot on a branch or on the trunk of the same tree. Other larvae, especially those who have fed on a smaller tree or closer to the ground, will leave the tree and seek a different tree or structure, such as a wooden fence or building. I once intercepted a brown Western Tiger caterpillar crawling fast, with a definite sense of purpose, toward my basement door. I suspect it was heading for a sheltered spot under a windowsill or on the houses wood siding, but it ended up spending the winter in a terrarium in my unheated garage. When placed in the terrarium, the caterpillar paced like a caged beast for the first day. Finally, it crawled onto a piece of wood and attached itself with a strand of silk. Two days later, the outer skin had split off to reveal a ridged, brown chrysalis resembling a dead leaf. It hung out at an angle, secured by its silken "girdle." I misted the chrysalis occasionally during winter and spring to keep it from drying out. By mid-June, when other swallowtails were cruising through my garden, it hadn't shown any sign of life. Because we were leaving on a trip, I took off the lid and set it outside in a shady spot. Upon returning, I was suprised to see an exquisite yellow butterfly resting in the terrarium. I gently extended my fingers to her; after she had climbed onto my hand, I placed her on a flower in the sunny garden. She rested for a moment and then flew to the nearby raspberry patch to bask on a sunlit leaf. Almost immediately, a male swallowtail appeared out of nowhere, and the two flew off in a courtship dance. Native nectar plants to attract Tiger Swallowtails include milkweed (Asclepias spp. ), phlox (Phlox paniculata), purple coneflower (Echinacea purpurea), black-eyed Susan (Rudbeckia hirta), Joe-Pye weed (Eupatorium purpureum), sweet pepperbush (Clethra alnifolia), buttonbush (Cephalanthus occidentalis), ironweed (Vernonia noveboracensis), beebalm (Monarda didyma), and buckwheat (Eriogonum spp.). Butterfly bush (Buddleia spp.) and lilac (Syringa vulgaris) are also very attractive nectar sources. 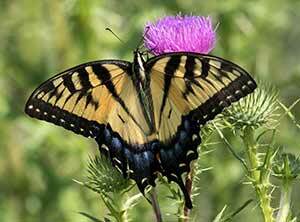 Male swallowtails are avid puddlers, gathering in groups to sip salts and other minerals from wet sand or dirt. These gathering places are referred to by lepidopterists as "mud-puddle clubs." If you don't have a pond or seep, put moistened sand in a container, elevated to protect the butterflies from pouncing cats. Birds take their toll on Tiger Swallowtails, too, as you know if you've seen a triangular beak bite in the wing of a butterfly who got away. Tigers obviously don't rely on camouflage coloration, but their boldly-patterned wings don't advertise unpalatability, either (as Monarchs wings do). While researching bird predation on swallowtails, McCorkle observed that many attacks occur when a bird comes across a resting butterfly, as on a cloudy day. The butterfly protects its vulnerable body by opening its wings and shivering violently. Vertical black stripes point to the vibrating tails, where bright orange and blue markings create a blur of color. The effect is like a blinking neon sign that says, "Attack down here!" Fortunately, many Tiger Swallowtails do escape with nothing worse than a torn hindwing, and during their short adult life (10-14 days), they are numerous and spectacular. Article by Claire Hagen Dole, Publisher/editor of Butterfly Gardeners' Quarterly. Summer 1998.